Ani's Side Note 10/28/18: I read this book back in 2014 during the time that I was all about YA. It was an excellent book, as I recall, and I loved it a lot. But I never really got around to publishing my review, for one reason or another, and as time dragged on, the written review simply got... well, set aside. As I was going through my posts at Booklikes and Goodreads to figure out which reviews I needed to transfer to Blogspot, I happened to come across this review, still in unpublished draft form, just waiting to be posted. So, what the heck? Here it is! As I read through it again, I like what I had written, and the chances of me rereading the book to get a second opinion aren't entirely high, since I rarely do rereads. Happy Reading! And thanks for dropping by. How do I start this one? This book was pretty much lots of awesome. The plot was interesting enough, though I might argue that it was fairly predictable in terms of peripheral characters, big secret reveals and the like. But it featured a unique and different voice with Meda Melange as a half-human, half-demon main heroine, who eats people's souls in order to survive. Yeah. Say good-bye to the sunny girl-next-door, or even the justice-seeking heroine with a heart of gold. Meda Melange is that main female character you wished that all the other YA heroines could learn a thing or two from about life. In fact, she should be their fairy (or demon) guide and tell them how to live out their situations. For instance, Meda doesn't get herself stuck in angsty romances as the girl who mopes about whether or not the hot guy really likes her. Instead, Meda is the one who snaps at the fawning couple to just get over themselves and kiss already. Either that or she steals her first kiss from the hot guy just to piss off his potential love interest -- no shame there. The issue hasn't been addressed yet, but I doubt she'd get stuck in any unnecessary triangles, rectangles, or multi-cornered polygonal undeveloped relationships either with the wondering whether or not the four (or five, or six or seven) hot guys like her and why. I have a feeling that if more than one guy fell for her, it would be on her terms anyway -- or she'd just make them duke it out to the death in her name just for the fun of it (even if she doesn't intend to choose either guy). She's also not one for martyrdom, not like most of the righteous, heart-of-gold heroines who are typically known for rushing blindly into danger to try to save the world despite knowing that death is what awaits them. No, Meda would rather be the one who points out the insanity of being willing to die for a cause when there is always the option of backing away and coming back to fight another day. You will never hear her say the words, "I would die before I let evil win!" or something like that. Meda is that little voice that we have in our heads (at least in my head) pointing out all the logic fails and the crazy actions that our heroes and heroines are always getting themselves into for the sake of... well, whatever it is they have reasons for. It's a little crazy that all the things that Meda snarks at her Templar friends for doing, I always had the same exact thoughts. Why are we proclaiming death in the name of a sacred cause? You guys are teenagers! Why are we angst-ing about lost friendships? You guys are still young! Life goes on! Why are we throwing our lives away, dying for a war? There's a quote I remember from a recent anime series I just finished watching that goes a little something like: "Don't fight for the glory of dying for a cause. Fight to live. Fight to survive." Because if your main objective is to "die trying", then honestly, you've already let the other side win; they have one less enemy warrior to deal with. Remembering back to my own adolescent, teenage years... events and circumstances always DID feel like they were ten times more dramatic than they needed to be, right? When I was a teenager, I had been told by some random adult that kids are always using extreme descriptions like the words: "never", "always", and "forever" to describe situations. Drama was pretty commonplace. And so Meda is a main character I enjoyed following a lot. While Cracked may not have had the best story line, Meda as well as her interactions with all the other characters around her made the story an extremely entertaining experience. Granted, even though I may file her Templar friends -- Chi, Jo, Uriel, etc... -- into that TSTL category, I have to admit that I also enjoyed their presence quite a bit. The TSTL thing was kind of expected considering their roles in the story. I mean, these Templars made a life out of fighting demons, training the children to fight in the name of God, and then ostracized anyone in the family who chose to live a normal life away from all the fighting and the blood. The whole "fighting to the death" thing wasn't surprising. I don't know how well I would have liked them individually without Meda to bring out their own sarcastic quips and snarks, but I certainly did not dislike them. 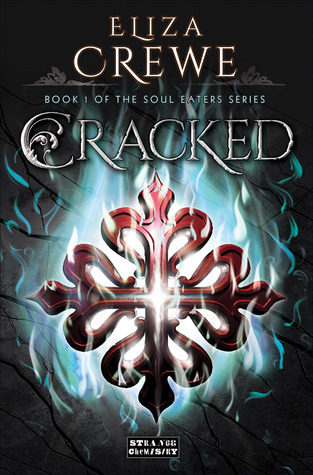 Cracked was an interesting new take on a main lead as well as the whole Supernatural-esque, fighting demons as God's warriors type of story. And with this book/series, I'm starting to think my own hopeless romantic side is fading -- after all, lately I've been loving the books that are much lighter on the romances than others... with some exceptions.